The most highly anticipated land at Walt Disney World Resort is set to open on August 29th, 2019. As we’re counting down to the Star Wars: Galaxy’s Edge opening, we wanted to compile everything we know about the brand new land so far. Star Wars: Galaxy’s Edge is set on the planet of Batuu, a never before seen port planet in the Star Wars galaxy. The land is going to feature two brand new attractions, Millennium Falcon: Smugglers Run and Star Wars: Rise of the Resistance. Pilot the legendary Millennium Falcon on a thrilling interactive mission through the galaxy or Join the Resistance in a battle agains the First Order! Millennium Falcon: Smugglers Run will open with the land on August 29th, 2019 while Star Wars: Rise of the Resistance will open later in 2019. The attractions will not feature the Disney FastPass+ service. Access to the land will require additional advanced reservations due to demand. The brand new merchandise options in Star Wars: Galaxy’s Edge will surely provide endless incredible memories. Docking Bay 7 Food and Cargo – Fuel up on galactic grub at this restaurant inside a hangar bay. The menu promises delicious and exotic offerings from throughout the galaxy. This is going to be a quick service style restaurant. Milk Stand – If you’re a fan of the Star Wars film franchise, you may recall Luke Skywalker himself enjoying a delicious blue milk and green milk concoction. Guests will finally be able to try these refreshing concoctions that are favorites of galactic travelers and locals alike. There will also be delicious snack stands around the land for you to enjoy more Star Wars inspired eats, including flavored popcorn and BBQ. Definitely plan to feast in this brand new land at Disney’s Hollywood Studios Theme Park. Stay at your own Galaxy Getaway! Are you ready to book your trip to come explore Batuu? Star Wars: Galaxy’s Edge opens August, 29th 2019 at Disney’s Hollywood Studios. 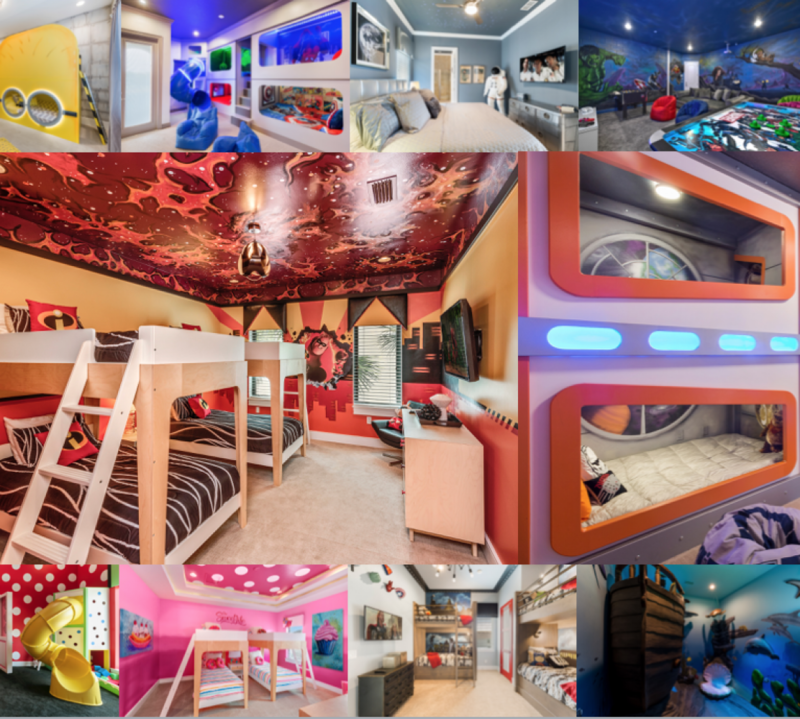 Stay in your own Galactic Getaway, as many of our magical homes feature amazing custom rooms to help you stay within the magic! Kids will love staying in this gorgeous galaxy room complete with bunks, custom artwork and a spiral slide! Check out RVH_350M – Signature Bliss. You’ll have your own spaceship at RVH_207M – The White House at Reunion, an ultra-modern luxury home! Slides and a custom space ceiling make this the coolest space room around at RVH_520M – The Fun House at Reunion! Want a cool spot to watch your favorite Star Wars film before exploring the new land? Check out the private movie theater at RVH_501M – Secluded Reunion Villa! Relax in luxury at RVH_400M – Be Our Guest Castle and watch a movie in the private home theater! This secret playroom at RVH_385M – Reunion Castle will take some galactic adventuring to discover, and is a great spot to hang out on your Orlando vacation! Vacation rentals are great options for traveling together with family or larger groups, and you’re still only located a few minutes away from the theme parks! Call our dedicated reservations team today at 1-866-991-3158 to book your galactic getaway today!